So what do you know? 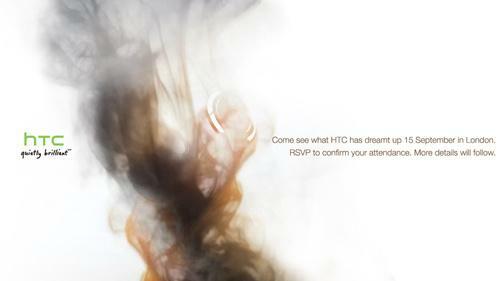 This morning I wake up and gleefully see that HTC has formally invited members of the media world to an event to be held September 15th. There is no indication that is related to a T-Mobile device launch but given the proximity to our supposed T-Mobile G2/HTC Vision/Vanguard launch date, we can’t help but get some hopes up! We know what we want this to be but we can’t get past the thought that it might be related to something non-Android related, perhaps Windows Phone 7 and possibly for another carrier. Still, we can dream, can’t we? ← So What Do I Think Project Emerald Is? If it doesn’t have the dual core processor…I just don’t care. Agreed. That’s the only phone I’m truly looking forward to this year. Check out the background… the image behind the smoke. My bet is the Desire HD. Looks like the identical camera ring to the photos that leaked recently. 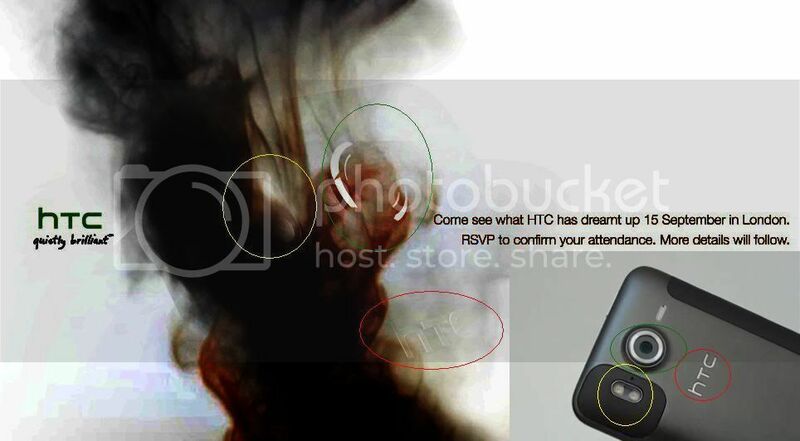 Also, not sure, but looks like it has the “HTC” logo below the camera ring, again, consistent w/ the leaked pics. David — Blow it up and let us see what’s back there behind that smoke!!! I agree, if you check out Gizmodo they updated the image thanks to someone who did a little photoshop magic and it does look like its the Desire HD, at least by the lens. Not a chance in hell would they call it emerald. If its HTC Android then its official mytouch business this is common knowledge. Well I’d say I’ll lose sleep over this news but that would be a lie. I’ll stay tuned to see what it ends up being and if more details leak as it approaches. It’s a move into a good direction with some details. Heres th elink where gizmodo helped traced out the picture to have a visual look of the phone. as long as it has android I’m good, I don’t care if it’s an exact EVO model as long as I can have it with my far better priced t-mobile plan and can replace my G1 i’m good to go, of course after checking it out in a store. OHHHHHH, i was kind of hoping to ditch the qwerty aspect but if it’s part of it I’d still consider it. I was just wondering why a phone launch for a US carrier would be in London? Isn’t HTC based in China, and T-Mobile’s parent based in Germany? Or is that normal for cell phone manufacturers, to launch a produce in a different country than the release country? thanks for any relevant/constructive input! Based just off of how T-mobile seems to operate never go with conventional wisdom; just think that and go the opposite direction and then you’ll be onto their line of thinking. Agreed, a UK media event for a T-Mo US based launched seems unlikely…. Unlikely yes, but not impractical…there are often a large number of events where phones have been announced for US availability but at an international gathering. I’m putting my foot down and saying its the Desire HD for the UK. Its illogical to launch products in an opposite country than the hosting country. HTC is a Taiwan-based company, not China. Just because you want to correct someone… the word you were looking for was Chinese! you guys post stuff slow as crap! other websites had it hours before you all! Sorry, I was sleeping…my apologies, I’ll stop sleeping. Big deal JAY..shut the F@#K UP!!!!!!!!!!!!!!!!!!!!!!!!!!!! SO WHAT. geez! T-Mo is taking too long to make this official, and I’m tired of waiting. I’ve been a loyal customer for 10 years, but I reserved an Epic 4G yesterday…T-Mo has exactly 18 days to announce something. Obviously, David, you were sleeping. We’ll cross our fingers for a T-Mo device in the bunch! ok, since it’s been a few days and nobody has asked yet…if it’s not a typo, what’s the “k” for??? And the day after I upgrade to this, they’ll release the 2.2 update for my MyTouch 3G. Bah, posted to the wrong article, IGNORE ME!!! Give me Android UMA or give me death. Hmm… if this was for the new G1 wouldn’t G1Blaze make since as the name” the all new G1 born of smoke and fire G2 Blaze them All, the newest generation of android smart phones starts Now! DUDE, WE ALL KNOW WHAT IT IS, IS THE NEXT GEN SIDEKICK, REMEMBER THAT THIS WAS HINTED AT HIPTOP3.COM LIKE 6 MONTHS AGO, THIS IS IT, FINALLY, IT’S ALIVE! I’m holding out to replace my G1 with the Dual Core phone and android. If it doesn’t come along I jumping ship. this phone its the htc desire hd look here: http://i22.photobucket.com/albums/b318/djdjdog/review.jpg and i hope it comes to tmobile with front facing camera.